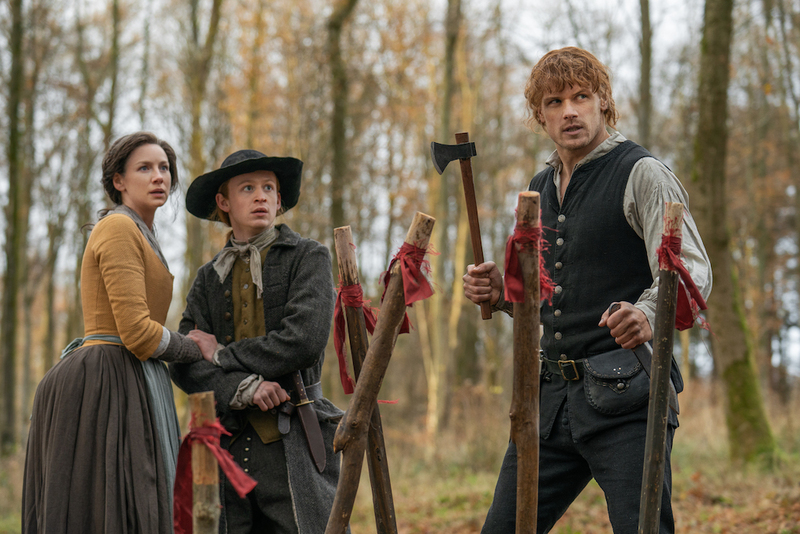 In this week’s Outlander, Jamie and Claire settle Fraser’s Ridge and come into contact with local Native American groups. Get a sneak peek of “Common Ground”! Courtesy of Starz/Sony Pictures Television, Inc.
Sassenachs, last week’s Outlander was a little bit of a reprieve. That’s not to say that there wasn’t drama. We watched a lovely trip between Bree and Roger and celebration of Scottish Highland heritage descend into angry words and resentment (mostly on Roger’s side). However, in 1760s North Carolina, Claire and Jamie arrived at what would be Fraser’s Ridge (thanks to Future Native American Man’s spirit). After the trauma of the first two episodes this season, it was wonderful to end on an optimistic note. I love that Bree can get some peace of mind about Claire being able to live her life with Jamie. Hopefully, Roger will also take the chance to apologize for being jerk-ish the last time they saw one another. Take a look at 15 images, where we get a glimpse of Jamie and Claire setting up their home in Fraser’s Ridge and coming into contact with local Native American communities. Make sure to live tweet the new episode with us at 8p/9c this Sunday (November 25) on STARZ!